For many people, the first introduction to life insurance is when a friend or a "friend of a friend" gets an insurance license. For others, a close friend or relative died without having adequate coverage or any life insurance. For me, I was introduced to a life insurance company where I had to set appointments with friends and family as I learned the ends and outs of the industry and hopefully, make some sales. Unfortunately, however, this is how most people acquire life insurance - they don't buy it, it is sold to them. But is life insurance something that you truly need, or is it merely an inconvenience shoved under your nose by a salesperson? While it may seem like the latter is true, there are actually many reasons why you should purchase life insurance. The face amount, or "death benefit" of an insurance policy (i.e., the amount of proceeds paid to the beneficiary) should be high enough to replace the after-tax income you would have earned had you lived a full life, presuming you can afford the annual premiums for that amount. In other words, the insurance replaces the income you didn't have the chance to earn by living and working until retirement due to a premature death. Whole life is the "Cadillac" of insurance; these companies try to do everything for you, specifically investing a portion of your premiums so that the annual cost doesn't increase as you grow older. The investment characteristic of the insurance means that premiums are generally higher than a similar term policy with the same face value. After all, whole life insurance is intended to cover your whole life. There are others, who have the belief that life insurance does not help them. To those individuals, the answer is: You are absolutely correct! The truth of the matter is that life insurance is a way for caring and responsible people to help ensure that their family can continue to move forward in the event of your untimely demise, a truly difficult time of loss. Of course, there is no bet - you will die, but no one knows when. It could be today, tomorrow, or 50 years into the future, but it will happen eventually. They brought me to this place that isnt my home. Everything that belonged to me and my mom, they had already packed. They took off my collar that had my name. I became nobodys dog that day. I sit here and wonder what I did so bad. I would have given them all the love I had. I poke my nose through the bars looking for a familiar face, but I know they are never coming back. I wonder if my mom knows what they have done? After his Owner died, this gorgeous hunky guy was left at the Shelter completely alone and totally confused because he is BLIND! His heart is broken and he needs help now, his energy is absolutely incredible and he would love a new home where he can feel safe again. Please SHARE for his life, he's SO special and a FOSTER or ADOPTER would save him. #A5243613 My name is HENRY and I'm an approximately 3 year old male Rhod Ridgeback. I am already neutered. 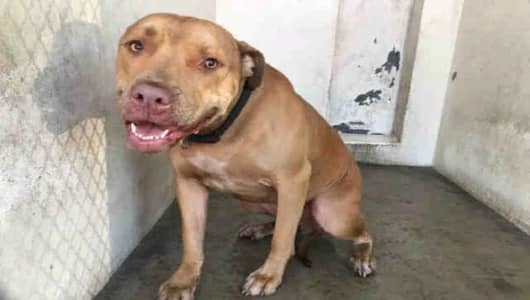 I have been at the Carson Animal Care Center since 12/15. I will be available on 12/15. You can visit me at my temporary home at C327. 8 Responses to "Owner died, not one family member care for Blind faithful pup trapped in high kill shelter"
This page doesn't allow links or copying text? I think more people would donate if they didn't have to type in that long link. Happy for Henry, but come on! Make things more simple, please. Julie . don't you know how to copy and paste ? Can you post a PayPal address?? Washe rescued? Please up date?